In true Grand Slam-winning fashion, the 16-year-old from Carrara fell to the ground in celebration after converting a fourth match point to become the first Italian ever to win a Junior title in Melbourne, beating American Emilio Nava 4-6 6-2 7-6 (14-12). The tournament’s top seed had come so close to Grand Slam glory just months previously at the US Open, losing in the final to Brazilian Thiago Seyboth Wild over three sets. So when Nava took the first set 6-4, it seemed as though history may have been about to repeat itself. Just as in New York, though, Musetti came out swinging in the second set, taking it comfortably 6-2. Seyboth Wild had proved too much for the Italian back in September, winning the decider 6-2. But against Nava, Musetti held his nerve to take the match into a final-set championship tiebreak. Nava managed to save three match points at 8-9, 9-10 and 10-11, before taking a 12-11 lead himself. Despite wasting golden opportunities to win his first major title, Musetti showed no signs of pressure, duly producing a big first-serve when match-point down, which Nava could only help into the bottom of the net. At the fourth time of asking, 13-12 ahead, the Italian was gifted victory by an uncharacteristically wayward forehand from Nava that flew long. 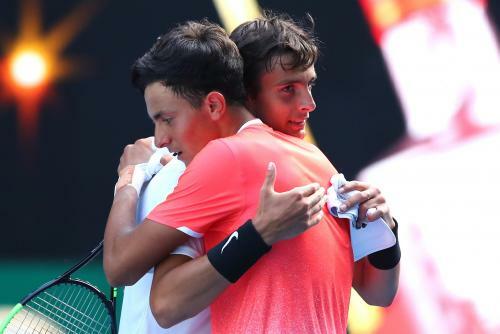 Cue disbelief, joy and relief all rolled into one as Musetti lay spread-eagled on the Rod Laver court in tears, almost certainly unaware that he had just made history. Falling at the final hurdle at Flushing Meadows in September was a big turning point for the teenager, who admitted in his on-court acceptance speech in Australia that “it had been a huge surprise” to reach the final in the U.S. Speaking to journalists in his post-match press conference, Musetti recognised that the “experience” he had gained in New York was a significant contributing factor towards his triumph in Melbourne, especially given his status as first-seed, which only added to the pre-existent pressure on his shoulders. The Italian’s demeanour when facing questions from reporters from across the world was particularly impressive. He took the whole occasion in his stride, was effusive in his praise for his opponent, as every gracious champion is, and showed a maturity that made it very easy to forget he is just 16 years old. Branding Musetti ‘the future of Italian tennis,’ as some critics have done, after just one Junior Grand Slam title may be somewhat excessive – others before him have been unable to translate success in their youth to the adult game (2013 Wimbledon Juniors champion Gianluigi Quinzi, who is currently 153rd in the ATP world rankings, for example). Yet the current crop of Italians on the ATP and WTA tours have had such little success, it is no surprise that those involved in the sport are crying out for a new generation to inspire a resurgence. Seven Italians entered the men’s singles draw in Australia, none of whom made it past the third round, despite both Fabio Fogini and Marco Cecchinato being seeded. In fact, of those seven, only Cecchinato has reached a Grand Slam singles semi-final – a brilliant run at the 2018 French Open included a spectacular victory over 15-time major winner Novak Djokovic. Since Roland Garros, though, the Italian number two has won just two matches in Masters or Grand Slam tournaments. Fognini does boast an Australian Open doubles title, which he won alongside fellow Italian Simone Bolelli in 2015, and has proven he has the game to compete with the very best – he once beat Rafael Nadal three times in the same year – but has failed to play at this level on a consistent basis. In fairness, the tennis produced by both Djokovic and Nadal in Melbourne shows just how far behind the rest of the field are, not just the Italians. The ease with which both players took apart their semi-final opponents was genuinely alarming. When the pair are in the sort of form they showed Down Under, the idea of anyone else challenging for a Grand Slam title in the next few years is almost inconceivable. So perhaps Fognini and Cecchinato can be forgiven for their lack of success, though results against fellow top twenty players are still disappointing. On the WTA tour, gone are the heydays of Sara Errani, Flavia Pennetta and Roberta Vinci, who won a collective 7 Grand Slams (singles and doubles) from 2011 to 2015. 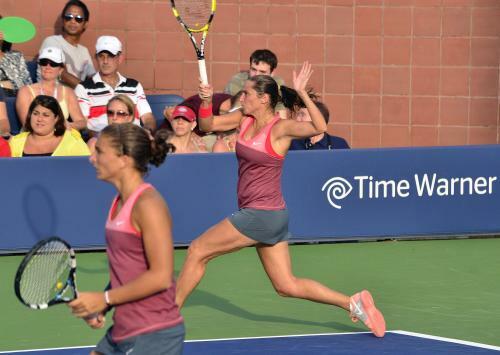 Errani and Vinci formed a formidable doubles partnership, reaching eight of a possible 12 Grand Slam finals from 2012 to 2014, collecting five winners’ trophies in that time. Their triumph at Wimbledon in 2014 completed a career Grand Slam for the pair (winning each of the four major titles), a feat only a handful have managed in the history of the game. Both have also added a Grand Slam singles final to their career CV. Errani was beaten by Maria Sharapova in straight sets at the 2012 French Open, while in 2015 Vinci toppled Serena Williams, who was almost unbeatable at the time, on her way to an all-Italian US Open final against Pennetta. Pennetta prevailed over two sets, doubling her Grand Slam collection after winning the 2011 Australian Open doubles alongside Argentinian Gisela Dulko. Camila Giorgi is now the sole Italian presence on the women’s tour. The 27-year-old ended 2018 ranked 26th in the world and reached a quarter-final at Wimbledon, where she took the first set of Williams. Whether she can convert her talent into results in big tournaments, however, still remains to be seen. Being talented, having potential, but unable to back it up with results, does seem to define the current generation of Italian players rather aptly. 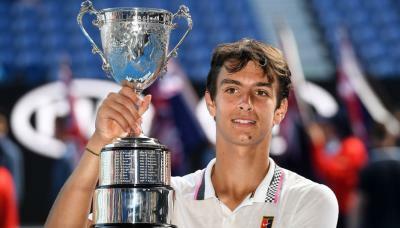 It is perhaps too early to judge whether Musetti can change that perception, but the qualities he demonstrated in Australia, in particular the mental fortitude to come from a set down to win a Grand Slam title, are extremely encouraging. A modern-day renaissance on the tennis court, with Musetti at the helm, could well be on the cards.